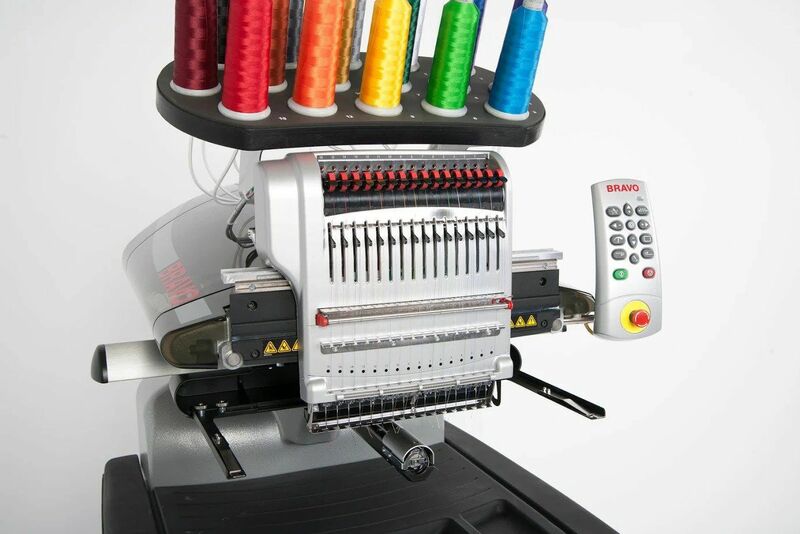 The BRAVO high performance embroidery machine is designed for the hobbyist, yet capable of commercial production. 16 needles for high production output. Easy cap sewing, large 270˚ sew field. Patented Acti-Feed™ thread control with auto-tension. Small cylindrical lower arm enables embroidery on a wide variety of products at high speed. Large 15.7" x 16.1" jacket back sewing field. Compatible with home and commercial file formats, includes embroidery software, Dakota Quick Click Program and 1,000 embroidery designs. Engineered in the United States. Network up to four BRAVOs to create a multi-head system. 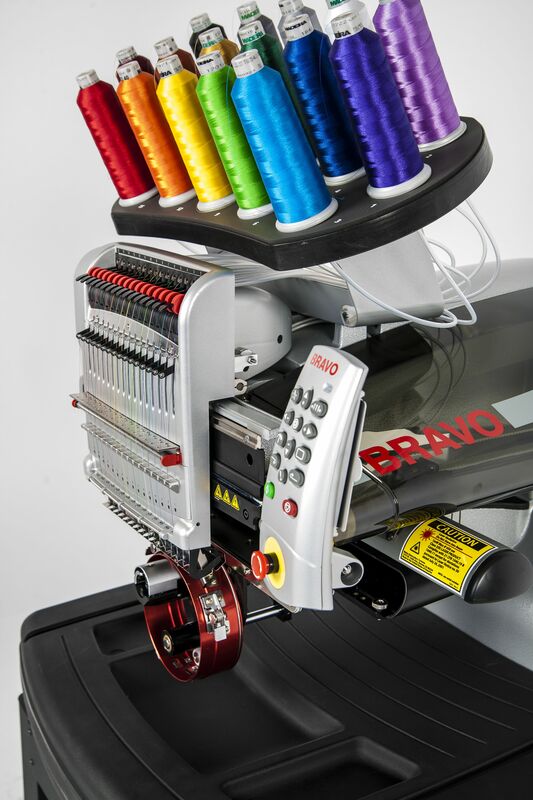 The BRAVO 16 needle professional embroidery machine offers businesses of any size powerful embroidery capabilities at an affordable price. The BRAVO can embroider apparel, caps, bags, and a wide variety of textiles with beautiful quality. BRAVO produces professional embroidery your customers demand. Registration of designs is easy with the laser alignment feature. Thread tensions are automatically adjusted by BRAVO OS. This feature reduces thread breaks and simplifies machine operation. There are dozens of popular hat styles, BRAVO embroidery machines can handle all of them. Simply remove the hoop arms, install the cap driver, hoop your hat using our supplier gauge and frame, and go to work! What type of equipment are you interested in? DTG, Embroidery, Dye-Sub, Laser cutting.